This is a classic slow cooker dish with a Primos spin to it! We substituted the classic ground beef (or turkey) for delicious bison meat. 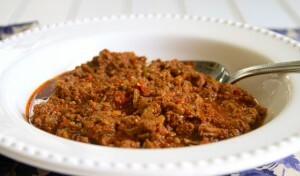 Bison is healthy, delicious and a great way to jazz a typically mundane dish like chili up! You can ladle your chili over Paleo Rice or even recreate the dinner classic — Chili Spaghetti — using spaghetti squash. Enjoy our tasty Paleo Bison Chili! Step 1 In a deep pan over medium heat, add coconut oil, onions, bell peppers and garlic, sautéing until the onions are translucent. Step 2 Add ground bison meat and brown. If water collects in pan, carefully drain it and resume browning. Step 3 Once bison meat has browned, place the contents of your pan in a slow cooker (or 4-quart pot). Step 4 Add to your slow cooker (or pot), puréed tomatoes, tomato paste, water, chocolate, hot sauce and all spices. Step 5 If using a slow-cooker, place on high and let cook for 4-6 hours. If using a pot on the stove, bring the contents to a boil, reduce to a simmer and allow to cook for 2-3 hours.